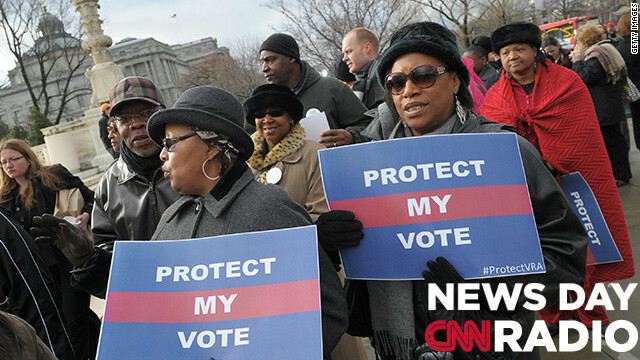 Activists hold a pro-voting rights placards outside of the US Supreme Court on February 27, 2013 in Washington, DC. "Something is wrong, my kids could go and find $83 billion out of a $ 4 trillion budget. This is not rocket science, what this is, is an inability to want to get to work. No one should be going home, no one should be playing golf, no one should be taking vacations." “The idea was that the Justice Department could oversee to make sure there was no discrimination. And Congress renewed that law just a few years ago back in 2006, and that prompted a challenge from a county in Alabama...and they say these changes are unfair." " They're considered dirty water dogs because they're probably all day in the water – boiling, steaming. It's a New York thing nobody else knows it. If you say a dirty water dog somewhere else in another state, you'll probably get smacked with the hot dog."